What this Arnab Goswami legacy outfit was doing was mainstreaming of the vitriol that has existed among Hindu fringe groups against Bhagwan. The news peg for this debate was that Bhagwan at a seminar of poets this week had said that Ram was not a God but merely a man with several positive attributes. To buttress his argument, Bhagwan quoted Valmiki, who had written the Ramayana, who according to him refers to Ram as a man, not God. Hindus consider Ram to be the seventh avatar of Lord Vishnu and therefore Godly and divine. Bhagwan has not said anything new. He made the same point in April 2015 at a programme organised in Davangere after which police complaints were lodged against by him by those whose sentiments had been offended. On the face of it, you could argue it is the right of every news organisation to debate contentious issues. But the problem here is of the position taken by the channel and the anchor. What this Arnab Goswami legacy outfit was doing was mainstreaming of the vitriol that has existed among Hindu fringe groups against Bhagwan for several years now. And the editorial position adopted meant that the Bhagwan school of thought was seen as an affront to Ram and the Hindu religion by extension. There are several problems with this hashtag journalistic position taken by the media group. You are cautioning that it is not advisable to provoke Hindus. You are meaning to say that a rationalist approach is fine only so long as it does not question the Hindu beliefs. You are saying free speech does not mean it can question Hindu faith. You are also suggesting that if you are a Hindu, you should be offended and provoked. This is a dangerous game being played out. Times Now was playing to a constituency, whose fringe players have already put Bhagwan on the hit list and increasing his vulnerability quotient. He had received a threat letter after fellow rationalist MM Kalburgi was shot at point blank range in Dharwad in August 2015. In fact, within hours of Kalburgi's murder, a Bajrang Dal activist from Mangaluru tweeted that Bhagwan will be the next target. To which Bhagwan did not respond in kind but instead invited him to a debate, asking him to write out his objections and challenge his scholarship. By using a caption ‘Protected by state', is the channel suggesting that someone who holds this view on Ram should not be provided security cover, especially he has received death threats. This when Gauri Lankesh, another author and rationalist has been killed just this month in Bengaluru. 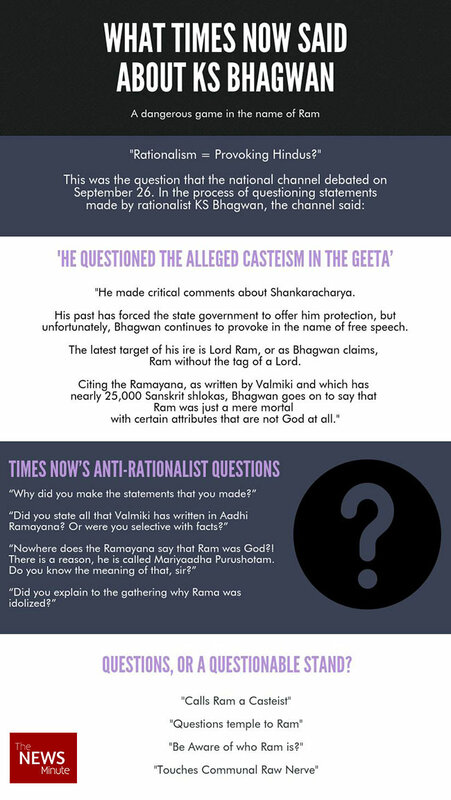 Debating is the way to be but the channel by positioning Bhagwan as the villain of the story was taking a stand against critical thinking and questioning. It was turning itself into a broadcast version of a Pramod Muthalik. Tomorrow, if some hotheaded Hindu, sufficiently provoked by the content, indeed attacks Bhagwan, will the channel take responsibility for having played a part in fueling anger and discontent? In a 21st century India, there should be space for critical questioning of just about everything, including Bhagwan's positions. But the media also has a responsibility to do so without arousing passions. The problem is a debate on this subject comes at the cost of more necessary debates on the economy which even according to the ruling party leaders and self-proclaimed thinktanks, is sinking. Surely prime time can be used better to debate on bread and butter issues because discussing the divinity of Ram alone will not usher in Ram Rajya. On social media, I find Whataboutery of the `Will Muslims keep quiet if Prophet is questioned in this manner and will Christians look the other way if Jesus Christ is spoken about this way'. The point being made is `We are Majority, offend at your own risk'. If indeed the copyright of being called `God' rests with Ram, maybe we need to be more worried about the word being misused by many who project themselves as Godmen or a Messenger of God. Especially in the light of the destination many of them have landed in.